HOLLYWOOD JUNKET Visited the set of “Let’s Make a Deal” and talked to some of the attending audience members hoping to get a chance to make a deal with host Wayne Brady. How are their chances of getting picked? And, do the costumes really matter? According to original host, Monty Hall, the answer is “no”. 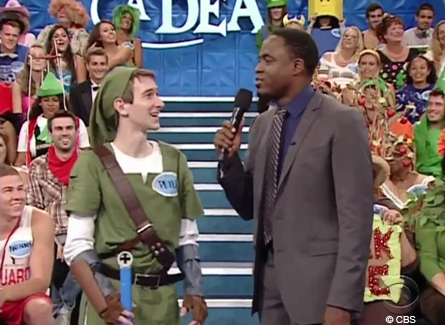 Monty Hall hosting the original “Let’s Make a Deal” with contestant. The man who created “Let’s Make a Deal” and hosted the original classic game show said the costumes today compared to when he was hosting are “exactly the same”. He also said, “We don’t pick them for what they’re wearing. You couldn’t do that, that would become a costume show. It’s too ingenious that they can do this.” He said he went to a costume party many years ago with friends as a six-pack and blowing bubbles with hats. They won first prize. Casting producers of “Let’s Make a Deal” from the second season, Mary Anne Bargen and Scott Schalk talked about the process of picking out potential contestants to be pulled-up to play the game. Schalk explained that about twenty-four people at a time go inside the casting room. It’s two rows of twelve. Then they file them back out into the holding room. “Everyone for the most part are just happy to be here and excited to see Wayne Brady,” said Schalk. A typical day for an audience member begins at around 8 am when they are expected to arrive to the lot. Processing starts at 9am, then casting talks them at 10am. The first show starts filming at 1:05pm. Make sure you bring your social security number in order to claim your prize if you win! We interviewed a potential contestant, Wendy, who has tried three times to get onto the game show. Potential contestant, Wendy says it’s her third time visiting “Let’s Make a Deal”. Her past costumes included a Lady Bug and most recently a Raggedy Ann out fit “with a little bit of a nerdy twist”. Her mom was on the original show was also Raggedy Ann with father who was Andy. Wendy said her parents won a washer and dryer on “Let’s Make a Deal”. Wendy is hoping to win a new car, specifically, a mini-van. 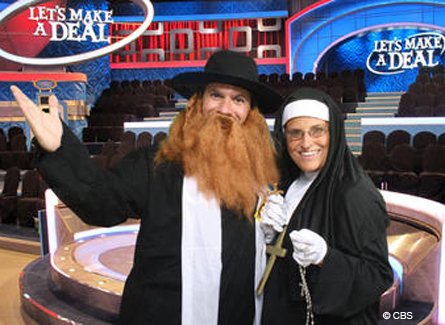 More on LET’S MAKE A DEAL: Getting Selected and What to Expect! 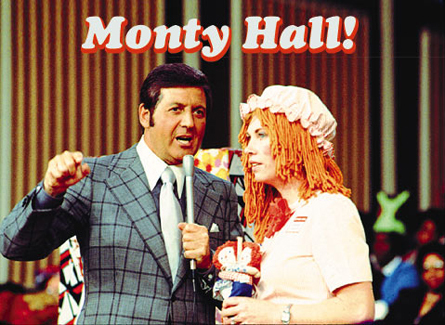 Full Monty Hall interview here: Monty Hall’s Visit! Hi let’s make a deal I called and I want to make a event with tiffany and Allison just have them send me a tweet or email me at Eric@gmail.ca Thank u!!!! Or contact me 5197768578 have a wonderful day!!! Does the show try to accessorize the costumes? They all look similar and almost too neat to be random costumes. Look like they come from the same factory? Any ideas on this? Yes. LETS MAKE A DEAL has a small boutique on the studio lot during the filming of their show that has accessories available to audience members to buy.